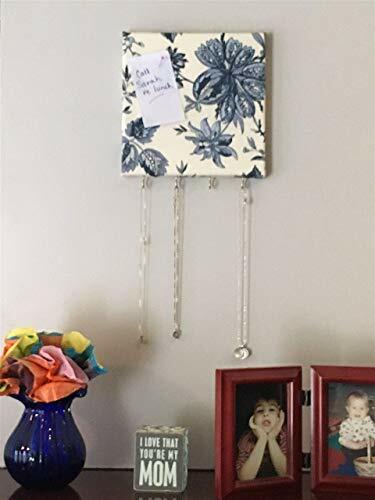 Organize your jewelry in style with this 8 x 8 inch fabric covered memo board. Four gold hooks keep necklaces and bracelets handy. Use the pin board face for photos, notes, lists, or more jewelry. Combine with our Rose Push Pin Hooks to easily hang extra jewelry. Mounted hardware makes it simple to hang. Choose from a variety of colors and patterns of home decor fabric options. If you have any questions about this product by Style Mamas, contact us by completing and submitting the form below. If you are looking for a specif part number, please include it with your message.